For this one-day autumnal workshop, students will learn how to make a hand-tied bouquet and arrangement using a variety of seasonal, garden-grown materials. During the morning session you will learn how to create a bouquet, focusing on blending colours, adding gestural flowers and creating a loose, natural shape finished with silk ribbons. Lunch will be followed by an afternoon class composing an asymmetric arrangement in a vessel. You will learn how to layer foliage, blowsy face flowers and intricate fillers to create a shapely design, ending with an opportunity to photograph your finished piece in a beautifully styled still-life scene. Students will leave with the knowledge of basic floral techniques for building a bouquet and arrangement, how to think about colour, scent and texture, and helpful tips on sourcing and working with seasonal materials. This class will be held at our flower studio in Shepherd's Bush, West London from 10am to 4pm, with a break for lunch. Refreshments, all materials, aprons and snips are provided. You are welcome to take home your designs after the class to enjoy. We finish each workshop by demonstrating how to style your finished piece for an atmospheric photograph so that students can capture their creation using their camera or phone - a great opportunity to practise photographing flowers for portfolios and social media, and to document an arrangement taking shape. Places are limited, we keep our classes intimate so that every student can benefit from individual attention. To book a place please click here. Autumn is one of the most beautiful, atmospheric times of the year in England. Everywhere there are banks of delicate lilac-pink Japanese anemones and speckled hydrangea at the very peak of their loveliness. The watery shades of summer darken to smouldering jewel colours of emerald and garnet. October is a magical time for foliage and branches; the leaves are turning and speckling, gold to lime to burnt russet, tall spires of summer flowers are going to seed. Texture and nuances of colour are rife in the garden. 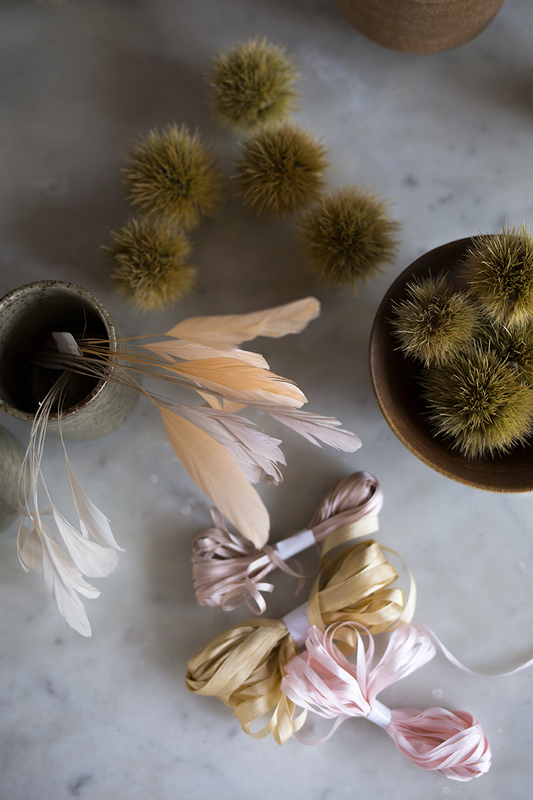 Students will be able to choose from an array of sumptuous autumnal materials. There will be fruiting and berried branches such as spindle and privet, gleaming rosehips, blackberries and sloes. Plump garden roses and dahlias will be used as focal flowers, layered with zinnias, Japanese anemones, sweet peas, poppies, chocolate cosmos and glinting metallic grasses.